Build a boat from a kit and race it against other boys in your den! Please follow the directions included with your Raingutter Regatta Kit for building your boat. A brief summary and tips are listed below, as well as the race rules and the awards to be given. Contact your den leader if you have not received your boat. The provided mast must be used as a mast and inserted into the provided hole on the trimaran hull. It may not be cut by more the one inch. The sail must then be secured to this mast. We suggest gluing the sail to mast and/or hull to prevent it from rotating. The sail must be the one supplied with the B.S.A. Raingutter Regatta Kit. The sail may be trimmed and shaped, but may not be larger than the material supplied. The outriggers should be shaped using the included sanding stick as described in the instructions. Overall boat width shall not exceed 3.625". Do not apply the racing numbers to the sails as directed in the kit instructions. Outrigger length must be between 5.75” and 6.75”. Mast height must be between 5.5" and 6.5" from top of the deck to top of the mast. If necessary to provide stability, a weight may be added, but must be glued securely to the boat. Scouts will be able to choose whether to blow from the right or left side of the gutter. Straws may be used to blow air through. Scouts may not use their hands or face to touch any part of the boat, gutter or table while racing. Repeated warnings or blatant infringement may result in disqualification. Each Scout will race at least twice. This is a double elimination format race. This means after the scout loses his second race, he will be finished racing. Scouts will race only other scouts having the same rank. If the scout is sick or absent on race night, his boat will be scratched from the race. There will be no racer substations for a missing scout. Trophies will be presented to the top three finishers in each rank level. Any unsportsmanlike conduct by the scout (or parent) can be grounds for immediate disqualification. Any scouts roaming in the school hallways during the races without prior permission from a Scout Leader can be disqualified. Trophies will be presented to the top 3 boats for each den. Get ready for the 2019 Pinewood Derby!!!!!!!!!!! If you haven’t received your car yet (they were distributed at the December pack meeting) contact your Den leader to arrange to get it. The link below has the full Pack rules, which supersede any rules listed in the car kits. Please pay particular attention to the length, width, height and weight regulations. They will be checked at registration. Please print and read the full rules to keep our check-in night fast and easy, and to prevent your car from getting eliminated! - Registration on Wednesday, 1/23, 6:30-7:45 pm at St. Gregory Church…across the street from Wilmot…NOT at Wilmot School. (The race on Friday night is at the Wilmot Gym). - All cars must be registered and impounded on Wednesday night to be eligible to race and receive awards. Scouts need not be present during Wednesday registration, but must attend the race on Friday. - Friends & Family Races: All race rules apply to cars entered in the Friends and Family races, including check-in on Wednesday night. There is no registration fee. Car kits are available at the Highland Park Scout Shop, and the Ace Hardware and Craftwood Lumber also usually have kits. Jessica McGahan (team.mcgahan@gmail.com) has kits available for $5. No more than 2 3/4 inches wide, 7 inches long, 5 1/4 inches high. Weight not to exceed 5 ounces. The post office has a self-service machine in the lobby (open 24 hours) that you can use for weighing. If you want to add extra weight during check-in you must bring your own. Use BSA approved wheels and axles that came in your pinewood kit. The front of the car may not have slots to improve the starting position of the car. The front edge of car must touch the starting pin in the center of the track. All four-axle points must be visible within the axle grooves. The bottom of the car must clear the raised lane keeper on the track. A 3/8 inch clearance is required. If you add weights to the bottom of the car you should recess them. The wheel track (measured between the inside edges of the wheels) must be at least 1 3/4 inches to clear the width of the raised lane keeper. In the spirit of Thanksgiving,individual Dens of Cub Scout Pack 50 will organize community service projects. There will be no Pack 50 meeting in November. Our next Pack meeting will be the Marble Tournament on Friday, December 14th. The Pack 50 Marble Tournament is Friday, December 14th at 6:30. This is a favorite event of the boys and everyone is going to have a really great time. Boys will be shooting in 3 rounds and we have awards for the top three scorers in each Den and an award for Good Sportsmanship. Meeting check-in is at 6:20pm sharp to allow us to keep the games on schedule. Please arrive early. Parents will be asked to volunteer to help judge, so please familiarize yourself with the rules...see “Marble Game Terms and Rules” below. No prior experience necessary. Marble must be propelled by the thumb. Lagging: Players roll or shoot their shooters simultaneously across the sheet to determine each Scout’s shooting order. Closest to the line without going over is the first shooter and so forth. Knuckling-down: A player MUST shoot with at least one knuckle of his shooting hand on the floor. Slips: Shooter slips out of a player’s hand while shooting. He must call out ‘slips’ and the shooter cannot have rolled more than 12 inches. Histing: Raising your hand from the floor while shooting. He must knuckle-down. Hunching: Moving your hand forward while shooting. The hand must remain still. Good Sportsmanship: Enthusiastic cheering, helping other Scouts, shouting encouragement, reminding shooter of slips, etc. 1. Get the score sheet with the player's names from the timer/scorer. 2. Verify the player’s names & begin Lag to set order for the game. 3. After Lag, set marbles in the cross. 4. Wait for judge’s signal to begin the game. 5. Keep Scouts off the sheet unless they are shooting. Shooter is only Scout allowed on the sheet. 6. Record marbles as shot-out by Scout. 7. Verify no Histing or Hunching has occurred. 8. Look (and listen) for Skips. 9. Look (and record) Good Sportsmanship. 10. Repeat 2 more times (3 games total). We will meet around the bonfire at the campsite where PROMPTLY at 6:30pm we will begin the Bobcat Ceremony for all the new scouts in our pack. PLEASE ARRIVE 10 MIN EARLY to make sure we can start on-time if your scout is participating in the ceremony. The Pack Meeting will start at 6:30pm and go until 8pm as it usually does,however families are encouraged to stay and camp overnight. The Pack has the area reserved from 3pm on Saturday - 12 noon on Sunday. You are encouraged to set up your tent before sunset. You are welcome to arrive as early as 3:00pm. Your Den Leader will let you know if your den will be meeting earlier at the campground that afternoon to work on requirements towards the dens rank badges or to let the boys just hang out together. Your Den Leader will also let you know if you will be cooking dinner as a den, as there is only one campfire pit that will be available to us. First Pack Meeting of the year! We’re going to have a welcome back meeting with popcorn-themed games. Popcorn information will be shared with the boys and parents as well. Hope to see you all there! Cub Scout Fall Kick-Off - Rocket Launch! This event also doubles as our fall recruiting event - letters and postcards were mailed to all 1st-3rd grade boys in early August. Please mention this event to your friends and neighbors and encourage them to attend with their grade school boys. We're looking forward to seeing everyone for the rocket launch. Your Den Leader will be delivering rockets to you in August. 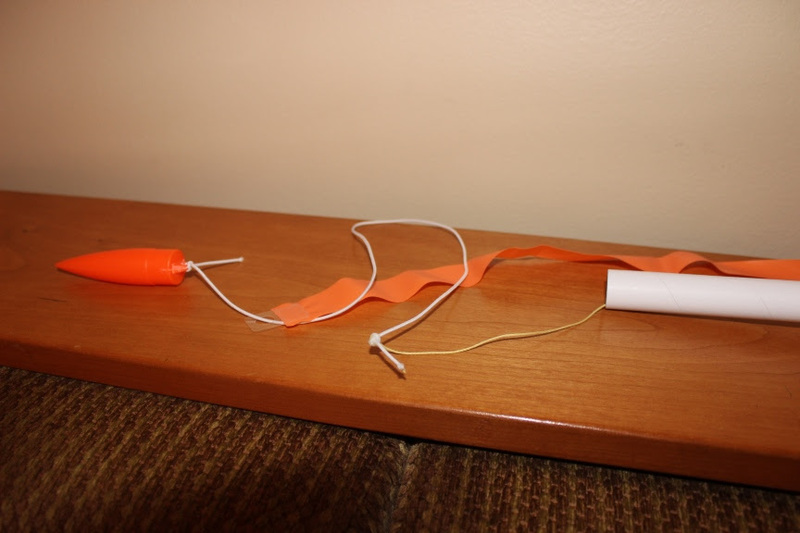 Assemble your rocket at home and bring it with you to launch. Allow glue to dry overnight before launching. Follow the assembly instructions printed in the package and use the tips below. - Don’t forget to decorate/name your rocket so you can identify it for retrieval (we do not have decorating prizes for the rockets, so save your most creative ideas for your Pinewood car). 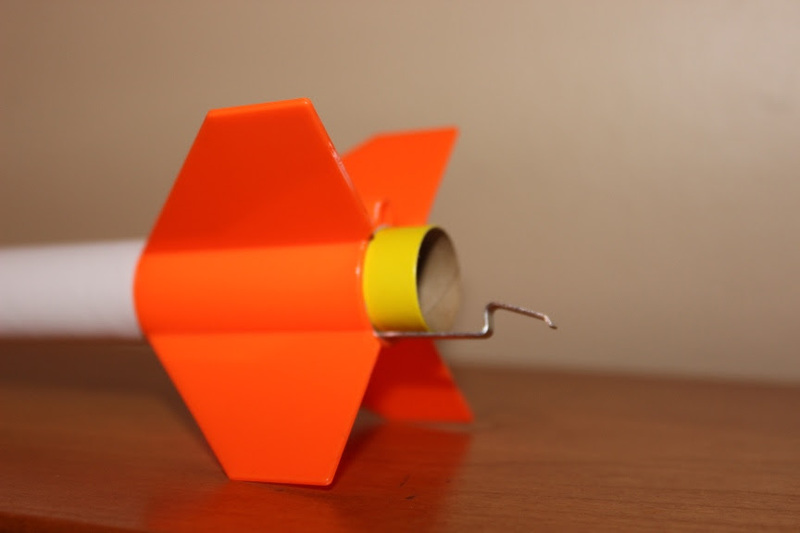 - Do not glue or paint the nosecone into position... it must easily pop out to release the recovery streamer. - Attached are two pictures below showing a completed rocket... please refer to these before finalizing assembly. 3) The motor clip was installed on the same side of the tube as the launch rod guide hole on the orange fins. Note in the picture below the guide hole is on top of the tube and the motor clip is on the bottom. 5) The nose cone was glued or painted into place. Also... Let your son know that he is only to retrieve/handle his own rocket. A Crossover Ceremony is a time to recognize Cub Scouts' accomplishments achieved throughout the year. They are now advancing to the next level of scouting. During the Crossover Ceremony all scouts will receive any remaining awards they have earned during the year. They will also receive their books and neckerchiefs for next year. Come out in honor of Memorial Day and join the Deerfield Scouting Community for the Memorial Day Parade on, Monday, 5/28/18. Area Scouts and their families have been invited and should plan on attending this important community event. We’ll march in the parade with the Sons of the American Legion Squadron # 738 and other community groups. Join us! Uniforms: Scoutsshould be present in full Class "A" uniform. Look sharp guys! Remember:breakfast, sunscreen, and water! Every October the Northeast Illinois Council sponsors Boo Camp at Camp Okarro. The district does a great job organizing the Halloween-themed day event in conjunction with local Boy Scout Troops. There are different activities for Cub Scouts of all ages set up throughout the campground. It’s a family event open to siblings, friends, and parents from all over Lake County. Scouts can wear their Class A uniform, Class B uniform (t-shirt), or a Halloween costume. Some of the activities are designed so that the boys earn rank advancements specific to their scout level. The event is offered in one hour increments throughout the day on Saturday October 17th. Our Pack has chosen the 1pm time slot if you want to attend with other members of your den. However, you can choose a different time slot if the 1pm time doesn't work for you. You must sign up on the NEIC website. Time slots will fill up if you wait too long! Everyone meets at the Immanuel Church (2300 N Dilleys Rd, Gurnee) 15 minutes before your session start time. Because the camp cannot accommodate parking, buses run continuously to/from the church and Camp Okarro (about 4 miles away). It takes about 30 minutes to get to the church from Deerfield. Be in the Deerfield 4th of July Parade! Wear your yellow Pack 50 t-shirt and meet us by 11:50am at the Boy Scout Troop 150 float on Deerfield Road in front of Deerspring pool. Bring water bottles and wear sunscreen. As always, siblings are welcome to join us. We will meet you there. All of the Deerfield scout troops and packs are hosting a booth in Jewett Park before and after the parade. Be sure to stop by and say hi! The Pack 50 Marble Tournament is Friday November 15th. This is a favorite event of the boys and everyone is going to have a really great time. Boys will be shooting in 3 rounds and we have awards for the top three scorers in each Den and an award for Good Sportsmanship. Bake sale sponsored by Webelos 2! Older dens will start following the Bobcat Ceremony. Parents, please stand with your scout during the Bobcat presentation to prevent noise from disrupting the ceremony. Parents will be asked to volunteer to help judge, so please familiarize yourself with the rules...see “Marble Game Terms and Rules” below and attached. No prior experience necessary. - Marble must be propelled by the thumb. 1. Get the score sheet with the player’s name from the timer/scorer.